My garden thriving last summer. During the last stages of my pregnancy last year, the business of working out how to manage my vegetable garden alongside a brand-new baby was high on my to-do list. 2012 wasn’t my most productive season ever, but I did manage to get a reasonable harvest despite a bare minimum of available gardening time. Read on for some tips from my experience. If you don’t already have your garden set up for growing, you’re going to need to do a bit more planning and organising, which I won’t cover here. Having said that, I moved house at 10 weeks pregnant and acquired a tiny, 100% paved garden. Over the next few months (and with assistance! 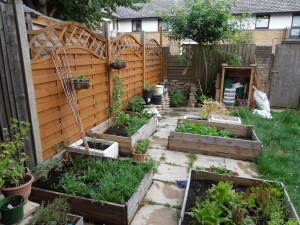 ), I slowly took up a bunch of paving slabs and built four new raised beds. And in my own special version of nesting, I built a garden shed at 38 wks pregnant and took delivery of the compost for those raised beds the day before I went into labour. So don’t give up if your garden is a mess right now! Vegetable gardening always goes better with a little planning, but it’s absolutely essential if you’re going to manage to do anything as a brand-new parent. What does my family actually like and eat? If you’re growing things you don’t care for all that much, your motivation is likely to suffer. What packs the biggest taste-punch from the garden? Tomatoes from your garden are something else again. With onions, the difference is less obvious. Put your effort where you’ll get the most gain. What produces most heavily? I prioritised fruiting or cut-and-come-again crops like peas, tomatoes, courgettes, and loose-leaf lettuces and greens. Crops that you plant once and harvest many times will maximise the return on your effort. How much looking-after do these plants need? The less attention required, the better. This is not the year to take on that special, delicate crop that needs daily care. Go with robust plants that can look after themselves. Once you’ve got your list, the next step is to work out what needs doing when. Check when each plant should be planted, and make a month-by-month list. Then assign a maximum of two things to plant to each week. Keep it minimal; if you’ve got more on your list than that, consider cutting it down. It’s better to have just a few successful crops than miss out altogether because you were too ambitious. Alongside the timing, work out where each crop is going to go. Your aim is to have all the information you need on your list. That way, when you have ten minutes, you don’t have any decisions to make. You just look at the list and do what it says. I don’t know about you, but my thinking faculties weren’t at their best when my baby was three months old. Finally, make a note on your list of what’s likely to be ready for harvest when. It sounds silly, but you don’t want to forget to check on the courgettes (zucchini) until they’ve turned into marrows. Now you’ve got your week-by-week list, put it somewhere where you’ll see it and be reminded of what to do each week. An online calendar and a weekly reminder email worked for me. A piece of paper stuck on the fridge might work better for you. Go with whatever will remind you that hey, this week you want to find time to plant a couple of rows of peas. 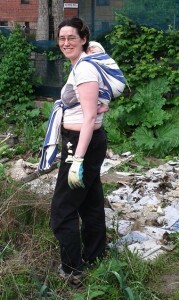 Weeding at the allotment with a sleepy 2 month old on my back. The single most useful thing for me in actually getting out into the garden was a decent carrier. I actually learnt to back carry my newborn at around 1.5 months (yes, you can do this safely with a woven wrap) partly so I could get some weeding done. But I also did some planting with him asleep in a front carry, or, as he got a little bigger, on my hip in a ring-sling. It’s not just useful, it’s also lovely to be able to take your baby out to the garden with you that early, and it’s good for them to see all sorts of adult activity. Another helpful option, if possible, is a co-parent who will take the baby while you go out and get some gardening done. A little alone time out in nature can be hugely revitalising. When your baby gets a bit bigger, try putting them down in the shade on a blanket on the grass while you potter nearby. I fondly remember one particular half-hour spent harvesting tomatoes and sowing late lettuce while Leon lay on the blanket, entranced by the light patterns our steel bowl made. Babies and gardens, even vegetable gardens, really can mix; and you don’t need to let the garden lie fallow while you’re baby-wrangling. Just a little advance thought and you’re away. What’s even better? When your baby starts on solid foods, some of their first taste experiences might just be (as my son’s were) veggies from your own garden. 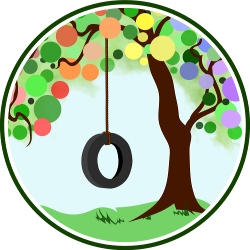 Juliet Kemp lives in London, UK, and blogs at Twisting Vines. She is thoroughly enjoying her attachment parenting journey. My biggest issue is all of the mosquitoes! I’ve got the babywearing down, I am totally fine with the wee one scrounging in the dirt, but I live in the South and the mosquitoes make being outside unbearable for my children. Ouch, not good! No ideas on that one, I’m afraid — we don’t get so many bitey insects over where I am (UK). The biggest thing that helped me was getting over baby dirt tasting. 😉 My children garden by my side from their first spring day. I found that wearing baby to garden has led to having a toddler who insisted on having his own garden this year. We took a wood vegetable crate and filled it with dirt to make his own manageably sized raised bed this year. Babies who are big enough to to crawl and explore love running their hands through the friable dirt, and it’s so much fun for them to handle the seeds, so long as they don’t eat them.